Saturday, May 6th, 2017, at 7:30 p.m., the Carter Family Fold in Hiltons, Virginia, will present a concert by Ralph Stanley II. Ralph II has done annual concerts at the Fold for nearly a decade now, and the Fold is thrilled to welcome him back for this year's concert. This will mark Ralph II's eighth performance at the Fold. His father Ralph and his uncle Carter actually performed at the A.P. Carter Park when A.P. presented music programs in the early 1950s. Those shows were held just behind the Fold at the foot of Clinch Mountain in an outdoor concert area. The Stanley and Carter families have been pivotal in preserving the region's rich musical tradition and carrying the music of the mountains throughout the world. Coeburn, VA -- Stanley Family Records is proud to announce a landmark new single, “Goin’ Round This World” by Ralph Stanley II & The Clinch Mountain Boys. The song appears on the band’s self-titled album releasing this summer. This is the first recording released since Ralph II honored his late father’s wishes by taking over the Clinch Mountain Boys band name last year after his passing. These big shoes are being filled by the talents of previous Clinch Mountain Boy John Rigsby on fiddle and mandolin, Alex Leach on banjo, Noah Brown on the upright bass, and Ralph II on the guitar. Gray Hawk, KY -- The 20th Annual Stringbean Memorial Bluegrass Festival will be held this Thursday-Saturday, June 16-18, at Stringbean Memorial Park in Gray Hawk, KY. Celebrating its 20th year, the festival honors Jackson County native and beloved Grand Ole Opry star David ‘Stringbean’ Akemon. His unique stage attire, traditional claw hammer banjo style, and entertaining stage banter endeared him to fans around the world. ’The Kentucky Wonder’ was best known for his musical comedic performances on the hallowed stage of the Grand Ole Opry beginning in the 1940’s and on the television series “Hee Haw” until his tragic death in 1973. Wise County, VA -- A new song about Southwest Virginia, by emerging singer/songwriter Kaitlyn Baker, has been tapped as the official theme song for tourism in the region. Baker, who is from Wise County, Virginia, wrote “Heart of Appalachia” with longtime collaborator Scott Arnold. Hiltons, VA -- Saturday, May 7th, 2016, at 7:30 p.m., the Carter Family Fold in Hiltons, Virginia, will present a concert by Ralph Stanley II. Carter Family friend Ronnie Williams will also be on hand to do some Carter Family tunes. Hiltons, VA -- If you were to gather together an average cross-section of people and ask them if they thought it would be an advantage for a performer to be the child of a living legend, most would probably conclude that it would have to be a definite plus. After all, the doors of opportunity would be quicker to open, and the spotlight of public attention that so many artists spend years trying to cultivate would be yours because – well – just because. Famous by default, so to speak, and doubtless those are very real and tangible advantages. But then there’s the downside – pressure. The learning curve, the whole growth process with all its potential missteps and pitfalls, is a public document. Most artists get to take those perilous first steps of their careers in relative anonymity, a nameless face in the crowd. Saturday, May 9th, 2015, at 7:30 p.m., the Carter Family Fold in Hiltons, Virginia, will present a concert by Ralph Stanley II. Admission to the concert is $10 for adults, $1 for children 6 to 11, under age 6 free. Hiltons, VA -- If you were to gather together an average cross-section of people and ask them if they thought it would be an advantage for a performer to be the child of a living legend, most would probably conclude that it would have to be a definite plus. After all, the doors of opportunity would be quicker to open, and the spotlight of public attention that so many artists spend years trying to cultivate would be yours because – well – just because. Famous by default, so to speak, and doubtless those are very real and tangible advantages. But then there’s the downside – pressure. The learning curve, the whole growth process with all its potential missteps and pitfalls, is a public document. Most artists get to take those perilous first steps of their careers in relative anonymity, a nameless face in the crowd. Saturday, May 10th, 2014, at 7:30 p.m., the Carter Family Fold in Hiltons, Virginia, will present a concert by Ralph Stanley II. Admission to the concert is $10 for adults, $1 for children 6 to 11, under age 6 free. Nashville, TN -- The ancient and the modern converge to create the timeless in Side By Side, the new Rebel Records album from vocal titan Ralph Stanley and his gifted son and musical heir apparent, Ralph Stanley II. Co-produced by the younger Stanley and John Rigsby, a former member of the elder Stanley’s fabled Clinch Mountain Boys band, Side By Side is a compelling collection of 14 new and traditional songs. It will be released Feb. 18. Among the highlights are classics from the pens of A. P. Carter, Charlie Monroe, Albert Brumley and Ernest Tubb and two Ralph Stanley originals—as well as samples of Stanley’s a cappella and clawhammer banjo stylings. Two of the musicians who back the Stanleys on the album—fiddler and mandolinist John Rigsby and banjoist Steve Sparkman—are from the 2002 Grammy-winning edition of the Clinch Mountain Boys. Nashville, TN -- The ancient and the modern converge to create the timeless in Side By Side, the new Rebel Records album from vocal titan Ralph Stanley and his gifted son and musical heir apparent, Ralph Stanley II. Co-produced by the younger Stanley and John Rigsby, a former member of the elder Stanley’s fabled Clinch Mountain Boys band, Side By Side is a compelling collection of 14 new and traditional songs. Hiltons, VA -- Being the son of a living legend isn’t easy. Despite the opportunities and public attention, there’s tremendous pressure to fill your father’s shoes. Your success or your failure in doing so is a matter of public record. Most artists get the opportunity to grow in relative anonymity. Ralph II didn’t have that luxury. When your father is Ralph Stanley, your course is pretty much mapped out at birth. Saturday, July 6th, 2013, at 7:30 p.m., the Carter Family Fold in Hiltons, Virginia, will present a concert by Ralph Stanley II. Admission to the concert is $10 for adults, $1 for children 6 to 11, under age 6 free. The Southern Ohio Indoor Music Festival is just around the corner and is expected to be one of the biggest and best events of the season! This year's fall festival will take on a special meaning for Joe Mullins. Janet Davis Acoustic Music and the Radio Ramblers will be working together at the festival to benefit breast cancer support. Joe's Mom, Prudence Mullins, passed away just over a week ago after battling breast cancer and Janet Davis Acoustic Music has donated a Martin guitar to be given away in an effort to raise funds for breast cancer research in her memory. Proceeds will benefit the Ohio area Breast Cancer fund. "I am certainly grateful for all the prayers and support from the Bluegrass community, and the help from our supply sponsor, Janet Davis Acoustic Music will have lasting benefits", stated Joe. Hiltons, VA -- Being the son of a living legend isn't easy. Despite the opportunities and public attention, there's tremendous pressure to fill your father's shoes. Your success or your failure in doing so is a matter of public record. Most artists get the opportunity to grow in relative anonymity. Ralph II didn't have that luxury. When your father is Ralph Stanley, your course is pretty much mapped out at birth. 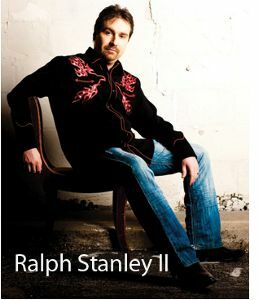 Saturday, May 12th, 2012, at 7:30 p.m., the Carter Family Fold in Hiltons, Virginia, will present a concert by Ralph Stanley II. Admission to the concert is $10 for adults, $1 for children 6 to 11, under age 6 free.